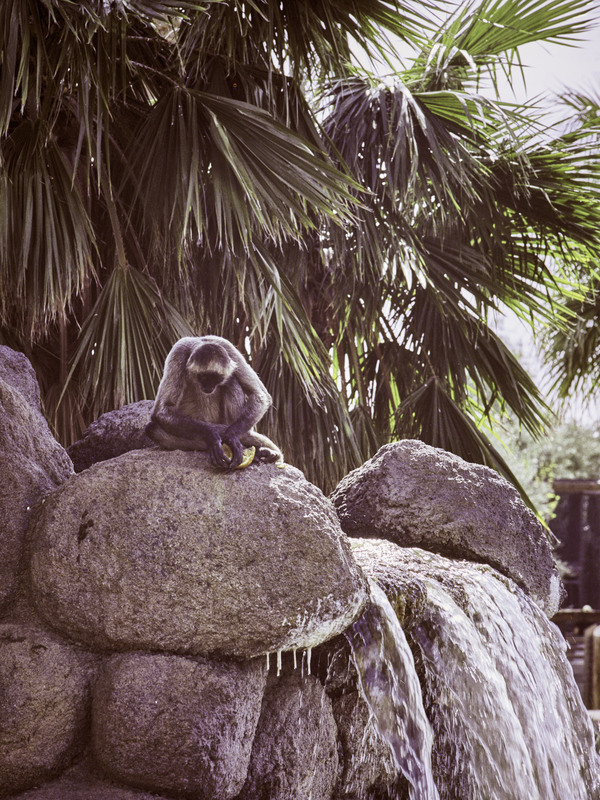 A monkey concentrating on eating a piece of fruit at the Wildlife World Zoo in Litchfield Park, Arizona. The past few weekends we’ve been on a kick of taking animal photo workshops with Arizona Highways Photography Workshops. Arizona Highways is a regional magazine known for stunning photographs of the southwest, and the workshops are an associated organization. The workshops cover quite a range of subjects from technical “how to” courses to multi day photo trips. I’m somewhat ambivalent about photographing animals in a captive environment. On one hand it seems kind of like cheating, but from a realistic standpoint some of these animals are either rare enough or so remote in the wild that a trip to their natural habitat is plainly outside our means. One thing that doesn’t bother me, however, is the care and condition of these animals. Having met and observed some handlers and trainers, I’m comfortable with the care and effort made to keep the animals healthy and engaged. I realize that not every place operates to that high a standard, that’s why some research is helpful before deciding where you want to shoot. So the first trip I’ll be discussing in this post is to the Wildlife World Zoo near Phoenix. This trip was run by Kathleen Reeder, a nature photographer who also has a gift for teaching and organizing. While these three skills are not necessarily mutually exclusive, the combination of all three is rare. On top of that Kathleen is very energetic and clearly loves what she is doing. Her excitement is infectious. Having shot at this location previously, I decided that I would shoot only film this trip. I’ve found that film causes me to really pay attention to what I’m shooting – the timing of a shot is essential. 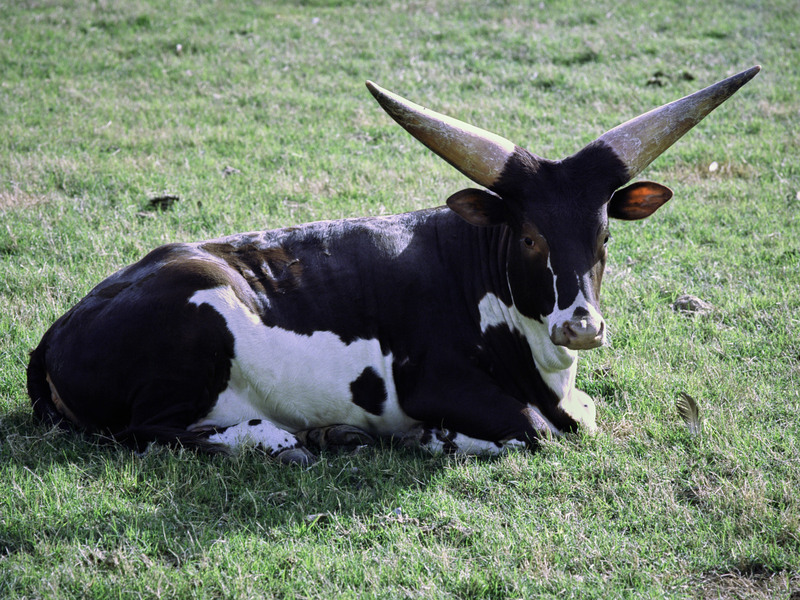 Ankole-Watusi cow catching some morning sun. These are very small horns for this breed. Wildlife World Zoo photos taken with a Hasselblad 500C/M and Portra 160/400 or Ektar 100 film. Unfortunately, the animals weren’t being very cooperative that day. It was a bit on the warm side and most of them had settled in. That’s not to say there weren’t pictures to be had, it was just a bit more work. I also had some problems with color cast in the film. I’ve taken to processing the film myself, and I’m not sure that I nailed the color correction this time around. I’ve decided to start a roll of film per week project both to practice and to see how long the processing chemicals hold up, but that’s the subject for another post. 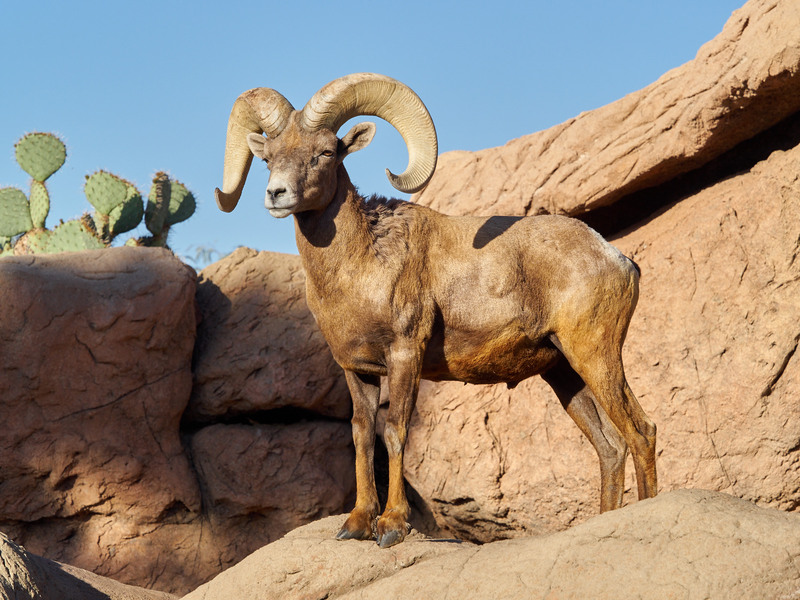 Big Horn Ram at the Arizona Sonora Desert Museum. The Arizona Sonora Desert Museum trip was also coordinated by Kathleen Reeder (we really like her!) Located near Tucson this museum is more oriented towards life in the Sonoran Desert strangely enough. While there are a variety of excellent exhibits, they really excel at the bird displays. Probably the highlight is the Rapture Flight, where they exercise several birds very close to you, as in you can feel them fly by on occasion. A Harris Hawk looking at the camera as he closes in. While these birds are close enough to get a really good shot, it can be tricky since they’re so fast. 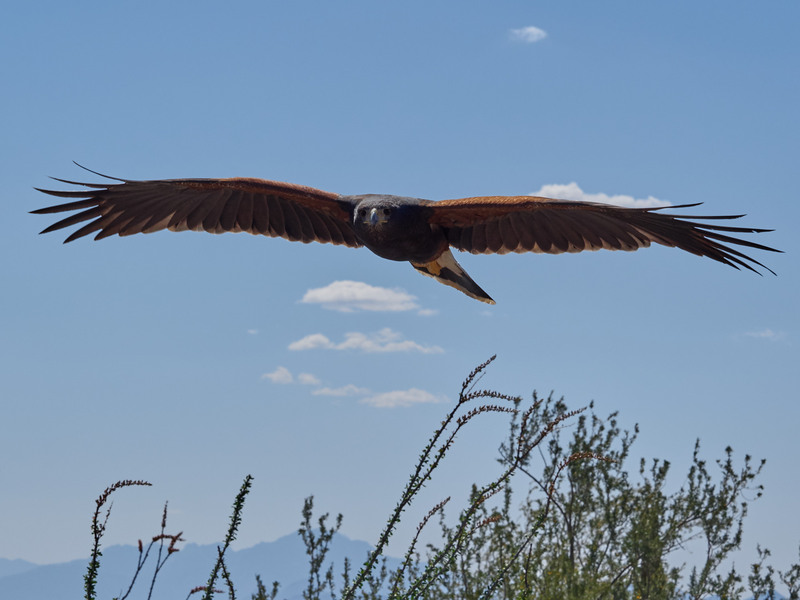 The Harris Hawks tended to soar which made it easier to get them in flight than birds like the Peregrine Falcon, which has been clocked at 240mph in a dive. They are quick! 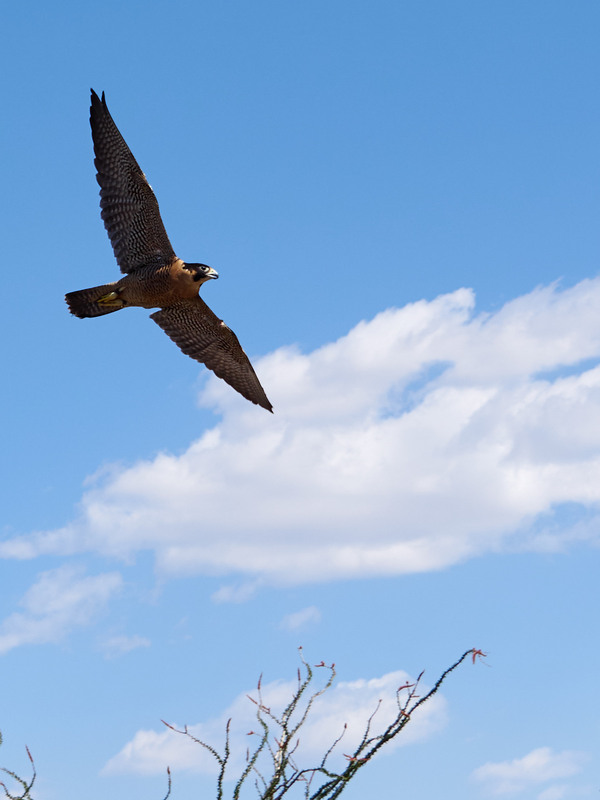 Peregrine Falcon doing a fly by. It’s not obvious in the photograph how much faster the falcon is moving than the hawk. Fortunately there were some slower moving animals as well. 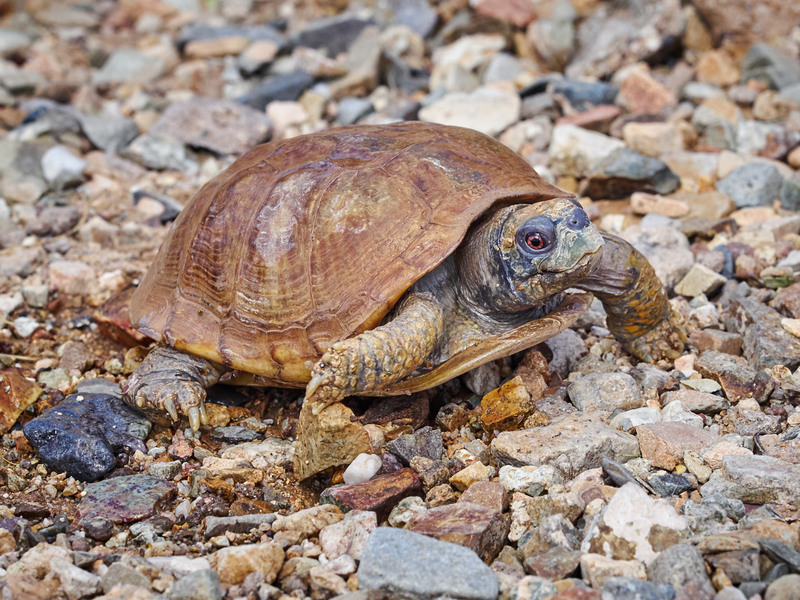 A long suffering box turtle gives us a baleful look. Arizona Sonora Desert Museum photos taken with an Olympus E-M1. The Sonora Desert Museum is a little out of the way to get to, but well worth the trip. Indeed there is some good looking landscape in the area as well. 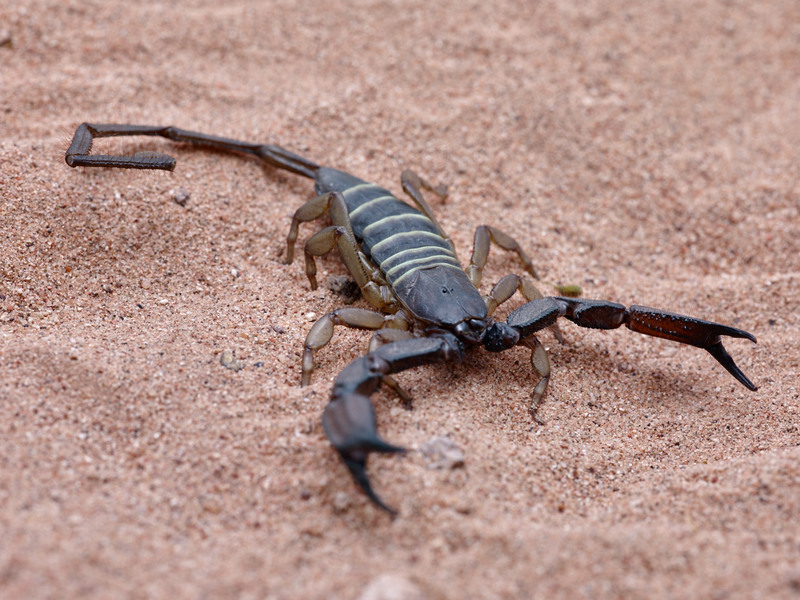 The African Black Flat Rock Scorpion. People make pets out of scorpions, but I prefer them to stay outside, myself. Finally we did the Creepy, Crawley Critters workshop with Bruce Taubert. Bruce and animal wrangler Randy Babb bring along a large selection of mostly venomous reptiles and insects and give you the opportunity to get closer than you ever expected to be to them. For the record, there was no glass or barriers between us and them. While never uncomfortable with being as close as we were, it did strike me at one point that I was taking pictures within striking distance of a moderately annoyed Tiger Rattlesnake. Of course, he was annoyed at Randy, and I figured he would strike at the camera, not me if he was feeling insecure. That’s my story and I’m sticking to it! A beautiful Tiger Rattlesnake. 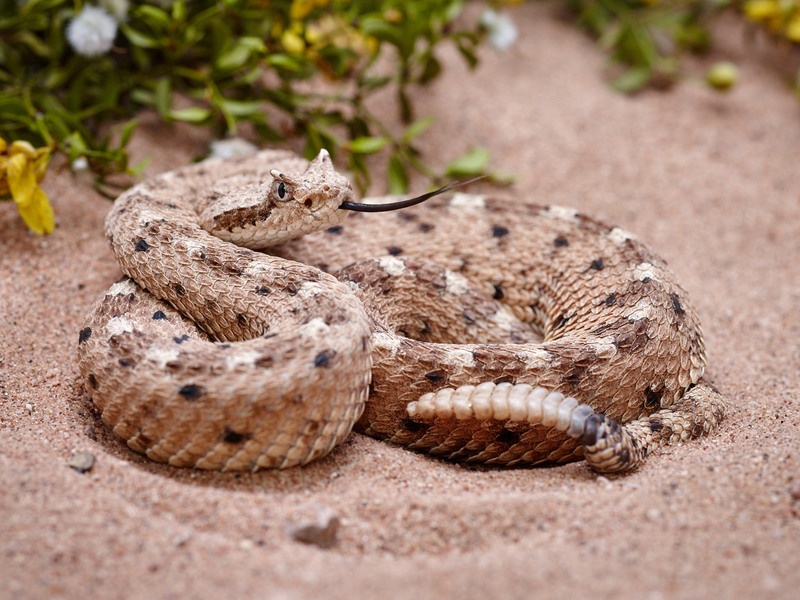 Their venom is the most toxic among rattlesnakes and the most toxic of all snakes in the western hemisphere, but the amount they inject is small, so they are not particularly lethal to humans. He does blend into that rock, doesn’t he? Bruce and Randy brought along several species of rattlesnake, a Gila Monster, scorpions, a tarantula or two and even some tree frogs (not venomous, but cute!) If you watch western movies you would think we have to elbow these things out of the way to get to the kitchen, but in fact they are generally pretty difficult to find. Even though we do a lot of hiking in rough country I’ve only seen two Gila Monsters in the wild over the last 30 years. 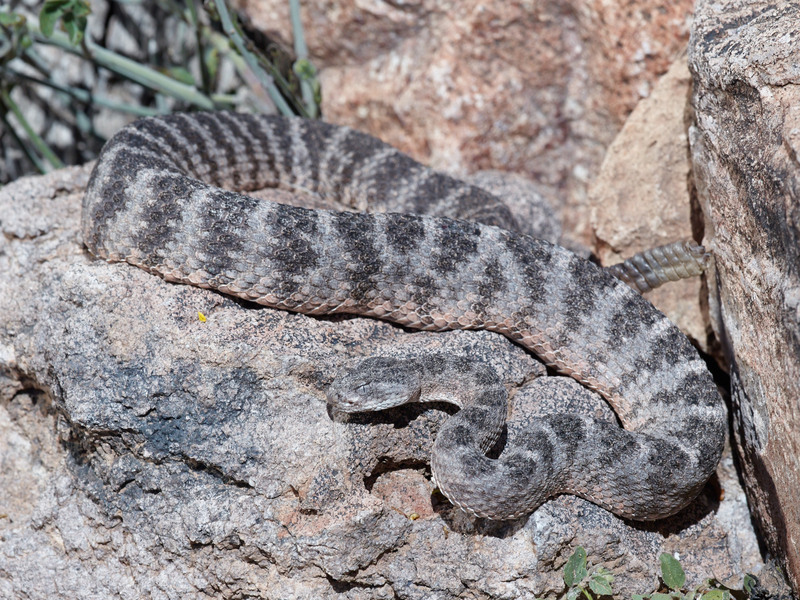 Rattlesnakes and scorpions are more common, but even with them you have to know where to look to find them. 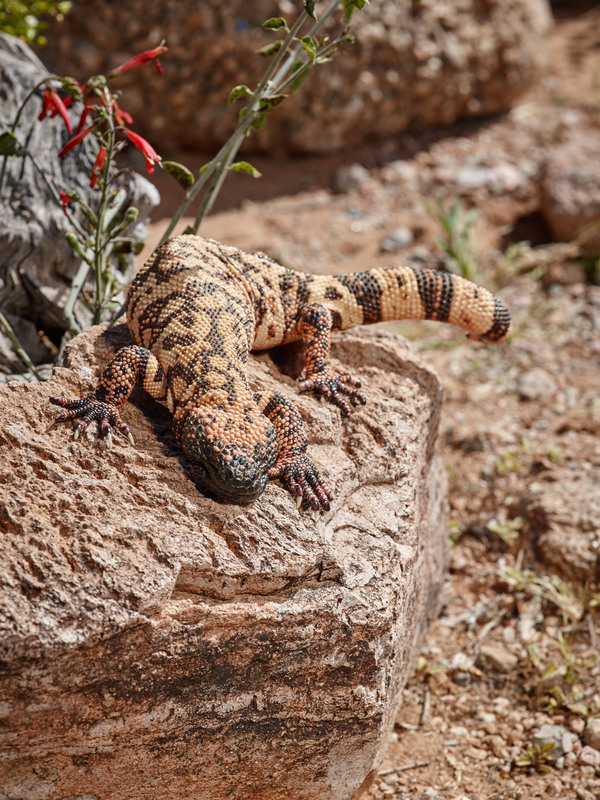 The Gila Monster – One of two venomous lizards in North America. Gila Monsters are pretty interesting. They don’t have fangs like the snakes do, but rather bite and hold on to let the venom get into the wound. They’re pretty active but shy. About every two years or so we’ll hear about someone getting bit by one and invariably it’s because they irritated the lizard instead of letting it get away. The Sidewinder is quite a bit smaller than the other rattlesnakes. Of course you have to get a photo of a Sidewinder. Smaller than the others and very quick, it has those neat horns above the eyes. This one sat patiently and posed for several of us for quite some time. Being a workshop doesn’t mean you can’t bring your own ideas in to the shoot. I knew we would have scorpions there, and while they’re interesting enough in their own right, I thought I wanted to have some fun with one above and beyond the normal and black light photography (they glow under black light.) So I decided that everyone’s nightmare is finding a scorpion in their shoe, or maybe not finding it in time. Randy was game so I got my set and lighting prepared and he brought a Great Hairy Scorpion over. 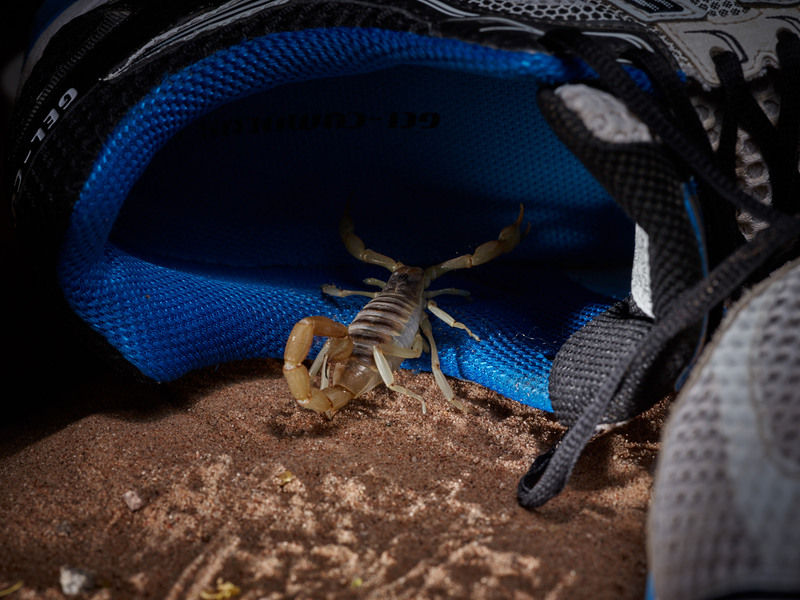 The scorpion was the perfect little model, checking out the shoe just like I hoped and even climbing inside. Yes, I shot this in my stocking feet, why do you ask? I’m sure it’s happened, but I’ve never actually met any one who has put their foot into a scorpion filled shoe. Plenty of people step on them barefoot since they do get into houses, and I know of one lady who got stung inside the mouth when she didn’t check a bowl from the back of the shelf before putting cereal in it. That one gives me creeps. For a workshop full of bitey, stingy things, the animals were easy to be around. For the most part as long as you didn’t make sudden moves they didn’t seem alarmed in the least. Bruce and Randy made sure that they were well cared for, taking the out of the sun once the day started warming up, for example, so the day went by with a minimum of stress to both the animals and the people. 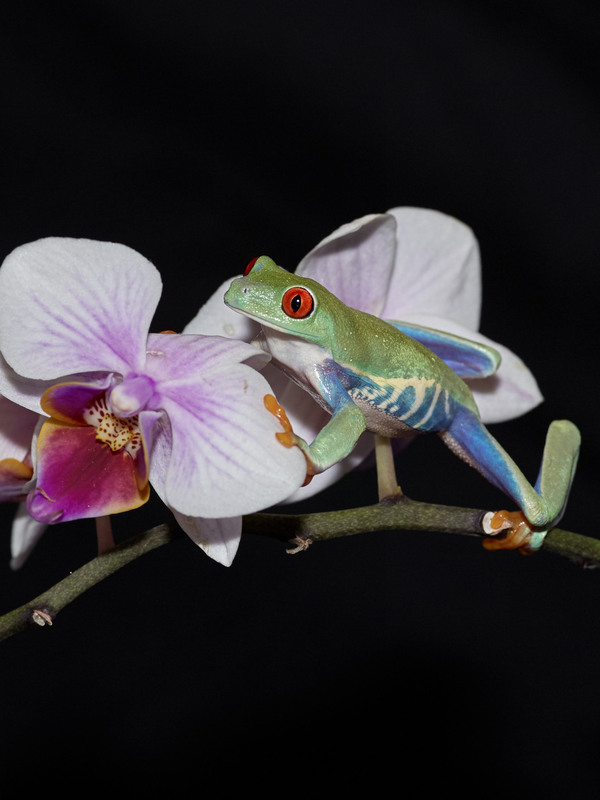 A Red Eyed Tree Frog to close with. A cute little guy who was kept well away from the snakes for obvious reasons. All Creepy, Crawly Critters photos taken with a Phase One DF+/P65+. This entry was posted in Workshops and tagged Animals, film, Nature on March 28, 2015 by Phil Ryan. Thanks for doing those workshops. They wouldn’t be half as much fun without you!